Ross's Law Marketing Blog: Opryland’s 24 MPH speed limit - and your website statistics. Opryland’s 24 MPH speed limit - and your website statistics. 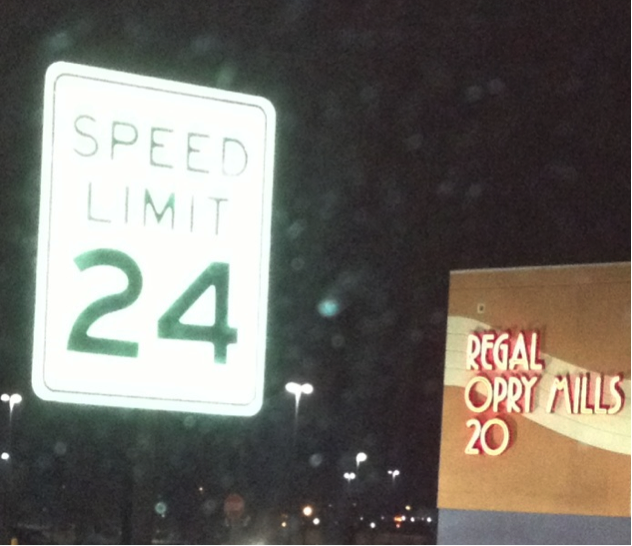 Opry Mills, the mega-mall outside of the Grand Ole Opry, has a curious 24 MPH speed limit. It caused us to wonder about it. Why 24 instead of the typical 25? We came up with three possible explanations, and ultimately a thought about its relevance to law firm website statistics. 1. It’s a fun conversation starter. Printing "24" instead of "25" cost them no additional money, but generates a lot of conversation. That's good marketing. This means you think about it more, and possibly obey it more closely. To a driver, “25 MPH” could mean “30” or maybe even “35.” But “24 MPH” means - “Drive EXACTLY 24!” It’s like telling someone to meet you for lunch at 11:57 instead of Noon. I know many of us went to law school because we couldn’t do math, but “more than 53” is 54! If you’re going to estimate or round up a figure, it must be a big round number, typically one that ends in a five or zero, or is a multiple of ten or 25. You can safely have “more than 25” practice areas, or “over 1000” lawyers.